If you are looking for custom t-shirts in Florida, then Tip Tops is the place for you! We’re your one stop shop for all of your custom designed t-shirts and your screen printing needs. We’ll take care of all the heavy lifting needed to design and deliver, vibrant shirts your organization will be proud of. Whether you need shirts to wear or shirts to sell, Tip Tops has the best products at the best prices! 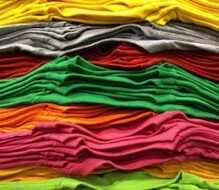 At Tip Tops, we know that everyone wants their t-shirts to be high quality and extremely comfortable. This is why we offer all the best brands, quality fabrics, and a multitude of styles. Some of the brands we carry are: Hanes, OGIO, Sport-Tekm IZOD, Port Authority, Jerzers, Columbia, and GILDAN. Not only do we offer top of the line brands, we also offer different styles such as v-neck or the traditional crew neck. At Tip Tops, we work with you to design the best shirt possible for your organization. We don’t cut corners when it comes to quality and we make sure you are 100% satisfied with your custom designed t-shirts. Our Central Florida printing facility has the capacity to handle any size job, whether you need 36 shirts or 36,000. So the next time you are looking for screen printing in Florida, give our friendly staff at Tip Tops a call today to get started on your customized t-shirts.